1 x Octa Softbox: 12"
1 x Octa Softbox: 8"
1 x Softbox: 8 x 12"
1 x Softbox: 6.25 x 8.5"
B&H has put together this Vello OctaSoft Quad Kit for Portable Flash for photographers who want to maximize their speedlights' potential with four ways to enhance their quality of light. The kit includes both 12" and 8" Octa Softboxes, and an 8 x 12" and a 6.25 x 8.5" softbox. Two Cinch Straps are included to secure the flashes to the softboxes. Reduce the harshness of your on-camera flash unit and soften shadows by equipping it with this large Octa Softbox for Portable Flash from Vello, which measures 12" in diameter. This convenient modifier produces a soft, almost wrap-around quality of light that is useful in a wide variety of situations, such portraiture, weddings, food, and more. Along with this, the octagonal shape will produce circular catchlights that are very pleasing to the eyes. It also features a foldable inner diffuser for further softening of the light and a reflective silver interior that evenly distributes light while maintaining maximum light output. Setting up the softbox is simple with an integrated elastic strap with a touch tab fastener that secures around the flash head. 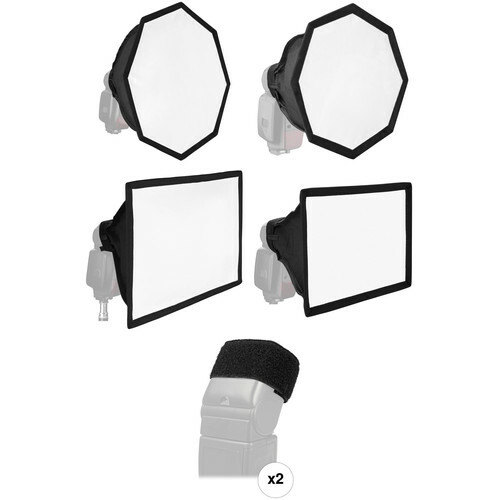 Also, it has a strap loop and rubberized mounting tabs that will ensure that the softbox remains securely attached. When not in use, the modifier will fold down flat, and a zippered carrying case is included for travel and storage. Reduce the harshness of your on-camera flash unit and soften shadows by equipping it with this medium Octa Softbox for Portable Flash from Vello, which measures 8" in diameter. This convenient modifier produces a soft, almost wrap-around quality of light that is useful in a wide variety of situations, such portraiture, weddings, food, and more. Along with this, the octagonal shape will produce circular catchlights that are very pleasing to the eyes. It also features a foldable inner diffuser for further softening of the light and a reflective silver interior that evenly distributes light while maintaining maximum light output. Reduce the harshness of your on-camera flash unit and soften shadows by equipping it with this large Softbox for Portable Flash from Vello, which measures 8 x 12". This convenient modifier produces a soft, almost wrap-around quality of light that is useful in a wide variety of situations, such portraiture, weddings, food, and more. . It also features a foldable inner diffuser for further softening of the light and a reflective silver interior that evenly distributes light while maintaining maximum light output. Reduce the harshness of your on-camera flash unit and soften shadows by equipping it with this medium Softbox for Portable Flash from Vello, which measures 6.25 x 8.5". This convenient modifier produces a soft, almost wrap-around quality of light that is useful in a wide variety of situations, such portraiture, weddings, food, and more. . It also features a foldable inner diffuser for further softening of the light and a reflective silver interior that evenly distributes light while maintaining maximum light output. Box Dimensions (LxWxH) 13.5 x 12.1 x 0.8"
Box Dimensions (LxWxH) 9.3 x 8.2 x 1.0"
Box Dimensions (LxWxH) 12.9 x 9.1 x 0.9"
Box Dimensions (LxWxH) 9.5 x 8.2 x 0.8"
Box Dimensions (LxWxH) 4.7 x 3.0 x 0.8"